CLEMSON, S.C. — No. 12 Duke will travel to No. 11 Clemson in a key Atlantic Coast Conference matchup between the two teams tied for second in the league. Game time for the clash at Littlejohn Coliseum is set for 1:00 pm ET, and live streaming coverage is available on the ACC Network and WatchESPN. 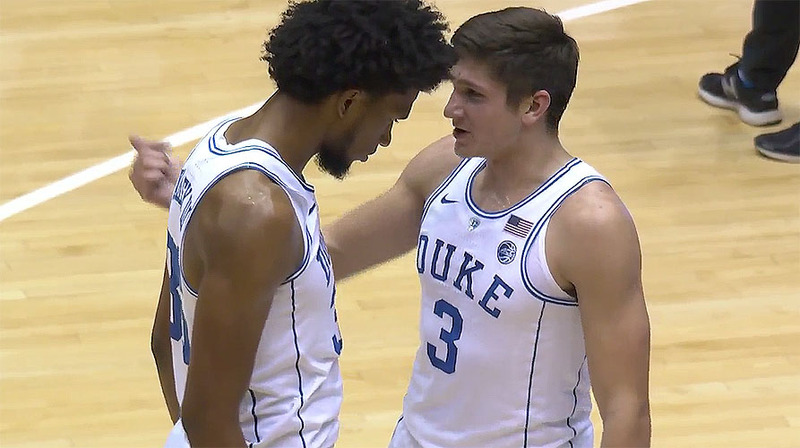 The Blue Devils (21-5, 9-4 ACC), who have won their last two games, enter Sunday’s matchup seeking their fifth win against ranked teams this season, having won games against Michigan State, Florida, Florida State and Miami. However, Mike Krzyzewski side has dropped back-to-back games versus ranked teams in ACC play this season and holds a 4-2 record against AP Top 25 clubs. Meanwhile, Clemson (20-5, 9-4 ACC) heads into this fixture hoping to rebound from the 81-79 overtime defeat to Florida State on Wednesday night. The Tigers have won four of their last five games and will take an undefeated 13-0 home record into this game. Duke will again be without freshman sensation Marvin Bagley III, who continues to recover from an injury. Bagley III will miss his third straight missed game after sitting out the wins over Georgia Tech and Virginia Tech because of a “mild” right knee sprain he suffered in the first half in the defeat against North Carolina last week. “Marvin is getting better, but you just gotta be careful, and that’s what we’re trying to be and he’s trying to be,” coach Krzyzewski said. Bagley III leads the ACC in points and rebounds per game, with 21.2 points and 11.4 rebounds so far this season. In the meantime, Clemson could be without junior guard Shelton Mitchell because of a concussion. Mitchell was hit in the final seconds of the clash against the Seminoles and was knocked out momentarily. He was immediately taken to a local hospital and although returning the university earlier this week, Mitchell remains in the concussion protocol and is expected to miss the game against Duke. Mitchell is averaging 11.8 points and 3.8 assists per game this season for Clemson. The Tigers are being led by in scoring by Marcquise Reed, who is putting out 15.7. He’s also very productive in ACC playing, averaging 16.4 ppg. Grayson Allen, who is averaging 15.0 points per game this season, has led Duke in scoring in the last two games, including scoring 25 points and matching a career high with seven 3-pointers in the victory over Virginia Tech on Wednesday night. Gary Trent Jr., Wendell Carter Jr and Trevon Duval are also scoring in double-digits for Duke this season. Sunday’s game is the 141st meeting between Duke and Clemson with the Blue Devils leading the series 109-31. Last time they met, Duke sealed a 79-72 victory over the Tigers in the ACC Tournament.